But, of course, we want all this to be done in a way that is both effective and colour coordinated with the club kit! 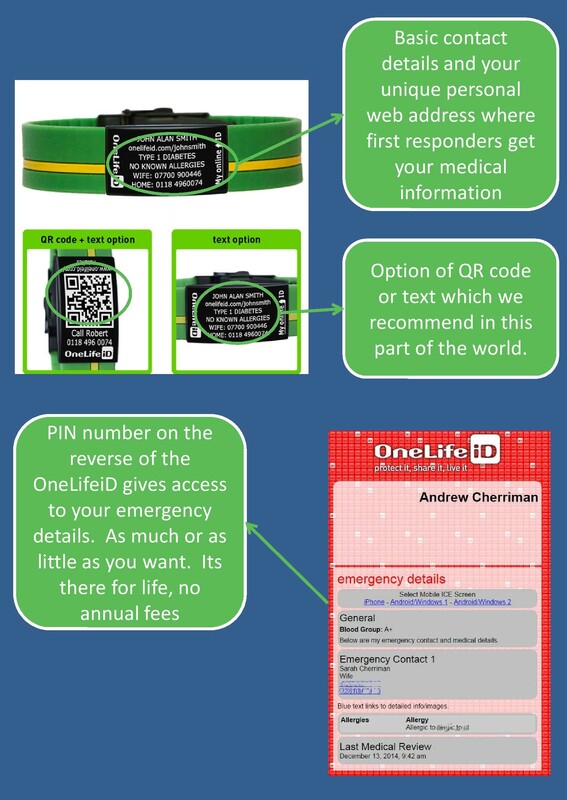 So we have worked with the great guys at OneLifeiD [www.onelifeid.com] to design an emergency medical bracelet in club colours which looks great and allows those first responders to gain access to whatever information you think they need including medical history, insurance details, credit card details, next of kin or emergency contact etc. etc. whatever you want really. And to make things better, not only does it look great, but for a limited number it is COMPLETELY FREE to existing members. Each paid-up member may claim one free OneLifeiD for a limited period of time. Send an email to our wonderful Membership Director Neridah at [cyclingmembership@anza.org.sg] with your name and membership number (it’s on your membership card). Once it arrives, there are instructions on how to cut the band to the right length and how to set up your lifetime account on the OneLifeiD system with all the details you want first responders to be able to see. Can you use the code for another product or another colour? No, the codes will only work for the ANZA Cycling coloured band.